In the first part of the article, we have told you about Darkher, Myrkur, Janaza, Andrea Haugen’s projects, and the real one-man band, the American multi-instrumentalist Becky Lee, best known as 'Becky Lee and Drunkfoot'. In the second part, we will talk about other interest groups, which feature only one performer. The singer, musician, and songwriter Chelsea Wolfe, due to her gloomy perception of the world, as well as flirtation with black and doom metal, has gained great interest among fans of avant-garde music. From release to release, the American diva continues experiments with her sound: starting with a light art-pop on the debut album "Mistake in Parting" (which was later taken off from the singer’s official discography), a few years later, Wolf presented the "first" LP "The Grime and the Glow", which sound this time was based on noise and gothic rock. The musician’s latest record "Abyss", released in 2015, embodies the obvious features of industrial and doom metal. Among her sources of inspiration, the performer names Scandinavian folk music, black metal, (back in a day, Wolfe has made her cover version of Burzum’s track "Black Spell Of Destruction"), avant-garde noise bands Suicide, SPK, the rocker Nick Cave, the Turkish singer Selda Bağcan, and the Russian songwriter Vladimir Vysotsky. Sylvaine is the eponymous project of the Norwegian singer and multi-instrumentalist, who is also known under her real name Kathrine Shepard. Her music is a melodic expansive shoegaze, sometimes dissected by sharp black metal screams. Serving as a composer, musician, sound engineer, and producer, Shepard released her first solo album "Silent Chamber, Noisy Heart" in 2014. This debut record was warmly received by both the audience and critics alike. Talking about the process of making music, Kathrine said that it’s "absolutely a cathartic process" for her. "Silent Chamber, Noisy Heart" drew everyone's attention to the young performer, who in the autumn of the same year opened Alcest’s show in South America. After the successful experience of joint concerts, Alcest’s leader Stéphane 'Neige' Paut, along with two other musicians, joined the project as the live members. After releasing not less successful LP "Wistful" in May 2016 via Season of Mist, the project is currently preparing for a series of live performances, one of which will be held in Kyiv soon. 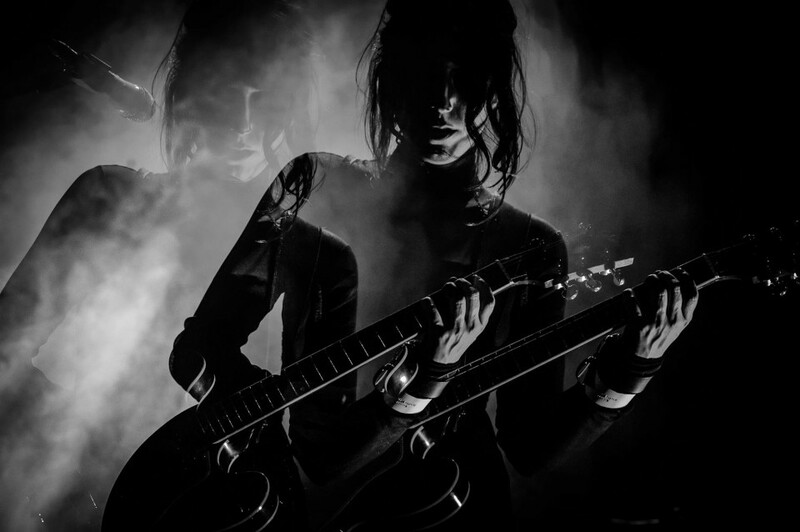 The founder of Rïcïnn is the French singer and musician Laure Le Prunenec, known for Öxxö Xööx, Igorrr, and Corpo-Mente projects. The performer is constantly trying her hand at various genres. Thus, if Öxxö Xööx’s creativity is classified as gothic/doom metal, Igorrr — as neo-baroque, Corpo-Mente — as experimental opera with trip-hop, then Laure’s solo project Rïcïnn can be characterized as experimental neoclassicism with elements of all above mentioned styles. On the singer’s debut album "Lïan" you can find a lot of amazing stylistic combinations for which this release was quite obviously described as avant-garde music by many critics. Rïcïnn is one of the most promising projects, and "Lïan" is one of the most interesting releases of the last year. Sera Timms’s solo project Black Mare is partly similar to the music of her compatriot Chelsea Wolfe. There you can also find a gloomy gothic atmosphere, as well as steady slow rhythms, but Timms compositions are not without their own charm, leading the listener into a state of peaceful melancholy. By the way, the other projects of the singer — Ides Of Gemini and Black Math Horseman — have common features, later embodied in the musician’s solo records. In 2013, Timms released her debut album "Field of the Host", and in 2015 — a split with the gothic rockers Lycia, featuring new song "Low Crimes". Another project from France is Aythis, created by the singer and multi-instrumentalist Carline Van Roos in 2006. The musician aims to be timeless and isolated from human nature, composing hypnotically depressing music with atmospheric keyboards and ethereal vocal. Roos’ lyrics is inspired by dreams, isolation and death. Aythis’ discography currently includes five albums, the last of which, "The Illusion and The Twin", was released in January, 2016. Anilah is a solo project of the Canadian singer and composer Drea Drury, whose aim is to create music which aids in cathartic and transformative experience. The basis of Anilah’s music is ambient folk, full of shamanic and esoteric elements. Behind Drury are two solo albums "Invoking the Numinous" and "Warrior", the last of which features a joint single with Wardruna’s leader Einar Selvik.